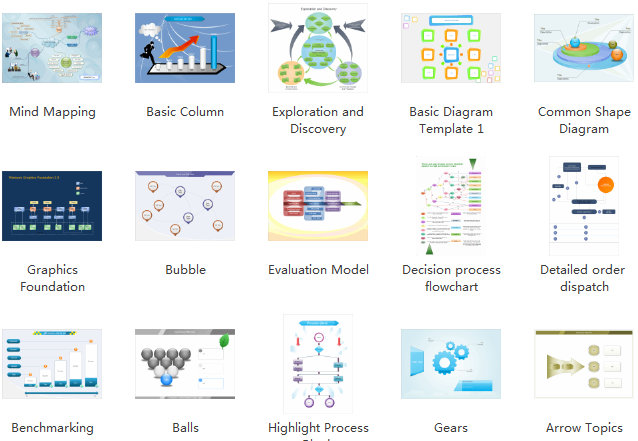 Some commonly used diagrams are grouped in Basic Diagrams category for easy access. Directly use or modify them to generate a wealth of visualization results. Shown above is a group of smart drawing shapes. They can transform flexibly, offering countless possibilities in diagramming. For example, the dynamic polygon shape can be turned into the following variations through the flowing action button. The triangle with angle is designed with automatic angle measuring function. After you drag the yellow control button to change it, the angles' degrees change on their own immediately. In this way you can gain any style of angle instantly. 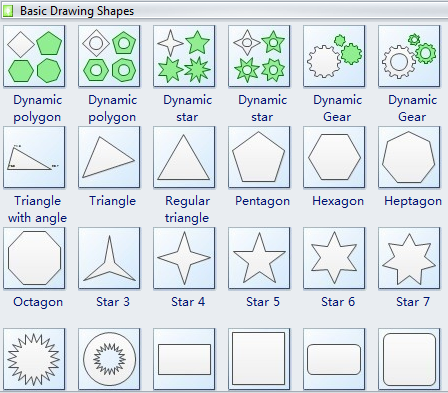 22 examples of basic diagrams are contained within Edraw Max. Click the links to download their PDF and editable versions. Have a look at some pictures of the examples mentioned above. Though the examples embedded are limited, users' possibilities to work magic on them are limitless. You can use them directly or turn them into your own diagrams, with different and personalized looks. Apply another theme to change the appearance with one click. Find much more information in the article How to Apply Themes. Change the fill styles of certain shapes. Add other shapes or some pictures to make them more pictorial. Insert hyperlinks, notes or attachments to enrich the diagram. Export the diagrams into other formats like PDF, Word, PPTX, SVG and VSDX and so forth. For much more information about exporting Edraw diagrams, see the article How to Export Edraw to Other Formats. Share the diagrams with others easily. Illustrate processes visually for easier understanding. Present operations step by step for effective communication. Make infographic slides for presentation to attract, engage and impress audience better. Save time and energy in diagramming. Increase efficiency in work and get job done fast. Collaborate with others super easily with dynamic and interactive visuals.